Medal engraved. Copy research. Commissioned 5th (Militia) Battalion, Royal Fusiliers. Medal roll (dated 12 Sept. 1901) confirms Cape Colony and Orange Free State clasps. Another roll (dated 31 October 1902) confirms South Africa 1901 & South Africa 1902 clasps. Volunteer Long Service Medal (Victoria) Presented to Sergt A.L. Polden, 1st Vol Batt. 'The Buffs' E.K.R. 24 Years Service. In Defence Medal (reverse) 1890 For long service 23 Years and Excellent shooting. (around edge) PRESENTED TO SERGT. A.L. POLDEN.D.COMPANY 1ST VOL.BATTN. THE BUFFS.E.K.R. Copy research. Albert Lantott Polden was born in London in 1847 and was a Customs Officer, living in Folkestone. He served with D (Hythe) Company, 1st Volunteer Battalion East Kent Regiment. 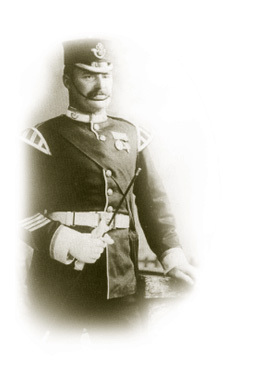 He was awarded the Volunteer Long Service Medal in January 1895. Early medals were issued unnamed and this medal has been nicely engraved. The Folkestone Herald (Feb. 11, 1911) "Mr. A.L. Polden, who has for over 45 years been a familiar figure at Folkestone Harbour, retired from the Customs Department at the end of last month. His popularity was clearly shown in an event which took place at the Customs House when Mr Polden was presented with a handsome testimonial, a purse of gold and a case of silver mounted pipes." The Folkestone Herald (Feb. 8, 1919) "We regret to state that Mr Albert Lantott Polden died on Sunday last, after a long illness, at his residence 23 Shellins Street ... Deceased served in the 1st Volunteer "Buffs" for 27 years and was the recipient of the long service medal. He was a splendid shot and won a large number of prizes on the ranges. Deceased was one of the oldest members of the Ancient Order of Druids." Sadly, in the same edition of the newspaper was the following notice: "Private A. Polden (Northumberland Fusiliers), youngest son of Mr A.L. Polden, 23 Shellins Street, and husband of Mrs A. Polden, 3 New Street, has died whilst on active service in Mesopotamia." Alfred Polden had died in September 1918. Medal roll shows entitlment to Cape Colony and South Africa 1902. Tom Wood. 27th Imperial Yeomanry. Tom Wood was from Kendal, Westmorland and was a butcher by trade. He had served with the Westmorland & Cumberland Yeomanry and enlisted into the 123rd squadron, 27th Battalion Imperial Yeomanry in January 1902 (aged 20), serving as an officer's groom. To South Africa May 1902 and returned to UK November 1902. Discharged 25 November 1902. Medal has a pin at top for wearing which has a representation of the KHK badge - this was the badge worn by Kitchener's Horse. Copy research. Clasps confirmed, the South Africa 1901 clasp earned with Robert's Horse. The rolls show that he transferred to Robert's Horse 1 November 1901. Alfred Bates was from Cockayne Hatley, Bedfordshire and enlisted in January 1890, aged 18. Served in Bermuda from July 1890 to April 1891, then UK until going to South Africa in August 1900 with the 2nd Battalion. Discharged at Johannesberg 31 July 1902 intending to settle in South Africa. His Queen's South Africa Medal had the clasps Cape Colony, Orange Free State and Transvaal. 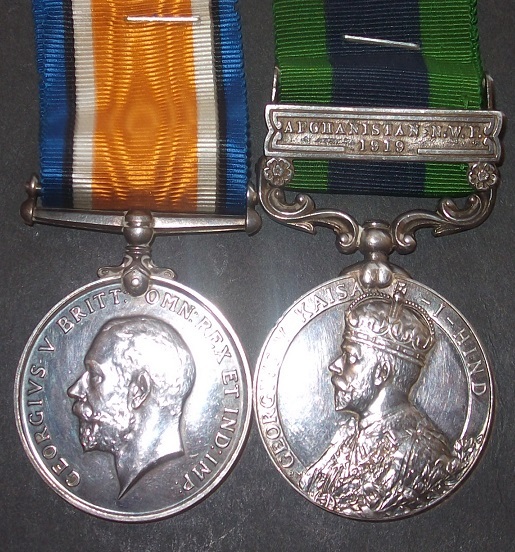 British War Medal 9255 CPL. J.W. CASTLE. YORK. R.
India General Service Medal 1908 Afghanistan N.W.F. 1919 9255 CPL. J.W. CASTLE. 1-YORK. R.
Copy papers. John William Castle was from Northallerton, Yorkshire and enlisted in April 1908. To India with the 1st Battalion January 1913. The battalion spent the entire First World War in India. Both medals confirmed. Discharged January 1920. 1914/15 Star 3088 PTE. G. LIDDAMORE. R.WAR:R.
British War Medal 3088 PTE. G. LIDDAMORE. R.WAR.R. Victory Medal 3088 PTE. G. LIDDAMORE. R.WAR.R. Copy service records. George Liddamore was living in Berkswell, Warwickshire when he enlisted int the 9th Battalion. Landed at Gallipoli 13 July 1915. Although his death is "presumed" on 21st April 1916, the War Diary reports no casualties that day. However, on 19th April in the action at Bait Aissa the Battalion reported 16 ORs killed, 68 wounded and 16 missing." He is listed on the Basra Memorial. 1914/15 Star 1119. PTE. J. PRINCE. R.A.M.C. British War Medal 1119 CPL. J. PRINCE. R.A.M.C. Victory Medal 1119 CPL. J. PRINCE. R.A.M.C. Territorial Force Efficiency Medal 390033 CPL. J. PRINCE. R.A.M.C. Copy service records. John Prince was born 1894 in Hull and enlisted into the 1/3rd Northumbrian Field Ambulance, RAMC Territorial Force in March 1911. Embodied 5 August 1914. L/Cpl. November 1914. Corporal April 1915. Went to France 20 April 1915. Discharged 31 March 1920. Medals mounted for desplay with TFEM round the wrong way. 1914/15 Star GS-5106 PTE. G. HIRST. 2-D.GDS. British War Medal GS-5106 PTE. G. HIRST. 2-D.GDS. Victory Medal GS-5196 PTE. G. HIRST. 2-D.GDS. Copy research. George Hirst arrived in France 23rd November 1914 served with the 2nd Dragoon Guards (Queen's Bays) through the war. Discharged to class Z 27 April 1919. The Regiment War Diary confirms that a draft of 48 men arrived at Fletre to join the regiment on the 24th. 1914/15 Star 18858 A.BMBR: J. HUTCHINSON. R.F.A. British War Medal 18858 BMBR. J. HUTCHINSON. R.A. Victory Medal 18858 BMBR. J. HUTCHINSON. R.A. Copy records. Joseph Hutchinson was a miner from Seaham harbour, Durham and enlisted in September 1914. He went to France in July 1915 and was discharged in January 1919. 1914/15 Star 743 DVR. D.H. ROBBIE. R.F.A. British War Medal 743 DVR. D.H. ROBBIE. R.A. Copy research. David Hebenton Robbie was born in Bolton, Lancashire in 1895. He enlisted in the Royal Field Artillery in June 1911. He was listed as wounded February 1916. Transferred to Royal Flying Corps in August 1916 was Acting-Sergeant by September 1917 (trade: fitter). To the RAF Reserve in March 1919. 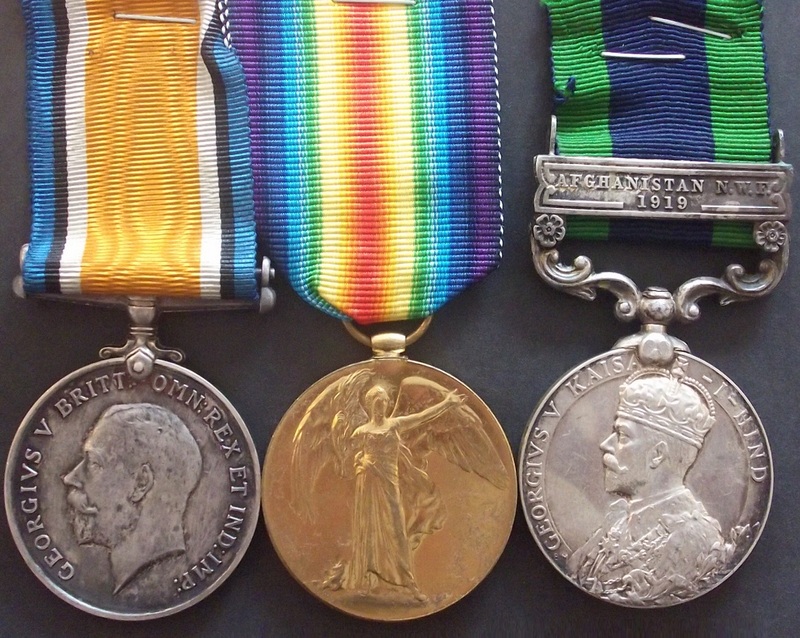 Private Leonard Gould & Pte James Gould British War Medal 52326 PTE. L. GOULD. WORC. R.
British War Medal 26081 PTE. J. GOULD. SOM.L.I. All mounted in a frame with a picture of a WW2 soldier in Somerset Light Infantry uniform (possibly a son of one of the two above men). Copy research. Leonard Gould was born in North Barrow, Somerset in 1899 and died of wounds 26 September 1918 serving with the 2nd Battalion Worcestershire Regiment. He is buried at Thilloy Road Cemetery, Beaulencourt. His brother James Gould served with the Somerset Light Infantry. Both also entitled the Victory Medal. British War Medal 1577 PTE. J. REAH. NORTH'D YEO. Victory Medal 1577 PTE. J. REAH. NORTH'D YEO. Copy research. John Reah was born 1890 and lived in Benwell, Newcastle upon Tyne in 1911. He joined the Northumberland Yeomanry and later transferred to the Machine Gun Corps (Cavalry). He transferred to the Reserve 28 July 1919. British War Medal 143360 A-CPL. R. ALEXANDER. R.E. Victory Medal 143360 A-CPL. R. ALEXANDER. R.E. India General Service Medal Afghanistan NWF 1919 143360 SGT. R. ALEXANDER, 2 Q.V.O. S & M.
Copy MIC for pair. 2nd Queen Victoria's Own Sappers and Miners, Indian Army.